← Roll up for the Karaoke Circus! Every so often I come across a pattern that is the equivalent of knitting crack. As soon as I see it I’m hooked, I wait impatiently for the yarn to arrive, and then I obsessively dedicate every spare minute to knitting it. And as soon as I’ve finished, I start another one. 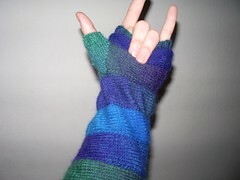 The Gasteropoda Mitts, by Kristi Geraci, are my latest fix. 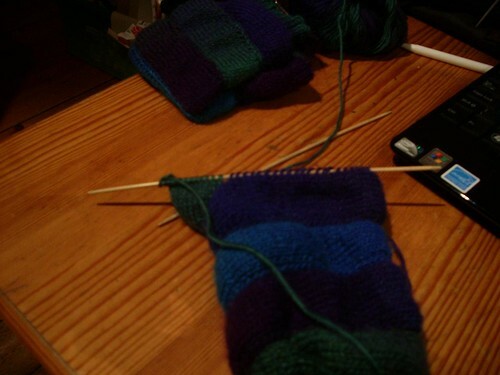 I also had a bit of an issue with the pattern first time round, misreading SSSK for SSK. So my first attempt came out ridiculously over-sized. 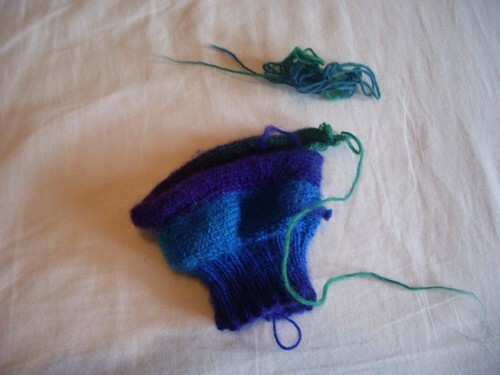 And the insanely irritating unique characteristics of the yarn made unravelling impossible. Damn and blast it to hell. Into the bin with this one. I love these mittens. *LOVE* them. They look lush, I like the colours. What’s the fit like on these ? I’ve been seriously considering making everyone Fetching mittens for next year (with Thuja socks for the men) but they’re a bit measly and they roll over at the top. BTW, the knit club at work has been going strong for a month if you want to come and join us. I can send an invite – we even have a fairly regular spot to sit at too. They’re really cosy and seem to fit brilliantly – I really recommend them! I love them too, thank-you! !